My step daughter is back for summer holidays. So, I am now in the mood to bake chocolate desserts. Chocolate is her favourite! 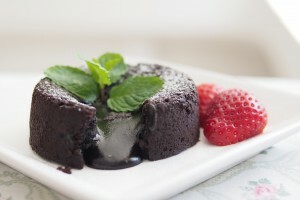 I made this Chocolate Fondant for her. Adapted from Sorted Food. In this recipe, I omitted the pistachio. Rub some butter around the inside of two ramekin dishes and dust with cocoa powder (this prevents them from sticking when cooked). Set aside. Melt the chocolate, butter and brown sugar in a bowl set over a pan of simmering water (do not let the bowl touch the water). Stir until all mix well. Set aside to cool slightly. Crack in the egg and whisk through, following with the flour. Spoon the chocolate mixture into the ramekins, clingfilm the tops and store in the fridge to cool until you need them. Remove the fondants from the fridge when ready to cook, take off the clingfilm and bake in a preheated oven at 200C (180C fan forced) for 14 minutes. Set a timer for this as it has to be precise. Take out from the oven, leave on the side for 30 seconds to rest, then turn them out onto the serving plate. Serve immediately with ice cream and strawberry.